There was a concerning crime in town with armed robberies in St. James' Street. It came at the Leeds Permanent Building Society when a man brandishing a handgun threatened a female assistant. She was forced to hand some money over and when police arrived she was able to give a good description, telling the police that the gun was silver and the man was wearing a blue bobble hat. Driving in to work that week, I heard a Burnley man on the radio. The man in question was Paul Brannon who worked at the Burnley Express. He'd phoned in to Simon Mayo's breakfast show in the 'Confessions' section although I'm not sure it was him who should have been confessing. Mr Brannon had been driving through the Trough of Bowland when he came across three men walking down the middle of the road in front of him. He sounded his horn and two of the men moved to one side but the other, somewhat ignorantly, continued walking down the centre of the road to the extent that he had to drive around him. I'm not sure what Mr Brannon must have shouted to the man but he got a shock as he passed him and realised it was the Duke of Edinburgh. Burnley's pub trade was again under threat as the licensees claimed their jobs were at risk because of Government legislation. They had taken their campaign to Downing Street and John Major, taking a break from eating his peas, had agreed to consider their plight. The local Licensed Victuallers Association had met with three local councillors. Councillor Richard Robinson wrote to the Prime Minister and, referring to the decision to place the licensees within the Landlord and Tenant Act of 1954: "This has backfired because of the misguided belief that the breweries themselves would go down a fair and just path, showing care and consideration for those people who, through their hard work and dedication over many years, have brought a huge return on outlay to the breweries." He also suggested that they were being treated as subhuman and he received a reply from Major's political advisor Stephen Yorke that read: "The substance of your letter has received consideration at the highest level." Whilst on the topic of pubs and licensees, there was trouble at the Mitre pub. Tina Bradley had been licensee for a year. The brewery had sealed off the pub which left Tina, her three sons and dog, marooned in upstairs rooms. What made it worse was them having to spend their days huddled in blankets and living on cold food after the gas and telephone services were cut off. "We can't cook, have a brew or make a phone call, it's just dreadful," said Tina. The brewery claimed the family had become squatters after they'd been given notice to quit the pub, this after she'd done them a favour in taking over the pub a year earlier. She was waiting to hear from the council with the hope of moving into a council house before Christmas. Two people who were most definitely not trapped were two Burnley men serving prison sentences at Haverigg prison in Cumbria. They'd escaped by using knotted sheets to scale a 17ft high security wall. They stole a car in Millom which they later abandoned in Kirkby-in-Furness where they then stole a van. The van was later found abandoned on the M65 near Burnley. Police were contacting relatives and friends and believed they were in the Burnley area. They informed the public that both men were wearing striped shirts and jeans when they escaped but could also have grey sweatshirts and dark donkey jackets with them. In sport, local boxer Warren Stowe had his second pro fight against Kenny Tyson of Leeds. Stowe was on top from the start and eventually the referee stopped it in the final round after Tyson had survived three counts. Burnley travelled to Aldershot in second place but with leaders Mansfield Town facing a tough away game against third place Barnet there was a real chance that Burnley could get that top spot for Christmas. The pessimists would tell you that our luck was at an end after a run of nine successive league wins had been ended a week earlier when Scunthorpe got a point at Turf Moor whilst the optimists believed this team wasn't likely to drop points in two successive games. Jimmy Mullen was cautious as he prepared to depart for Aldershot. "Everything is going against Aldershot at the moment," he said. "They are struggling at the bottom of the table, all their players are up for sale and nobody seems to know how long they can survive, but that makes them even more dangerous. "The players know that another win can help keep the creditors away for a while and while they are all in the shop window, the players have every reason to try even harder. Aldershot are fighting for their lives and that means we will really have our work cut out." Mullen also confirmed there was a new face around the club with goalkeeper Mark Kendall having arrived to help coach the goalkeepers. Kendall was at Swansea City but Mullen confirmed he had no intentions of signing him either permanently or on loan whilst also confirming there was nothing in the rumours suggesting a month's loan for former Claret Gerry Peyton from Everton. Ian Measham and Roger Eli were both doubts ahead of the game. Measham was passed fit but Eli was ruled out with Graham Lancashire coming in. New signing Adrian Randall was named as a substitute for the first time and against his old club. Mullen was right. Aldershot came at us in the opening minutes of the game in awful conditions caused by a near gale force wind. 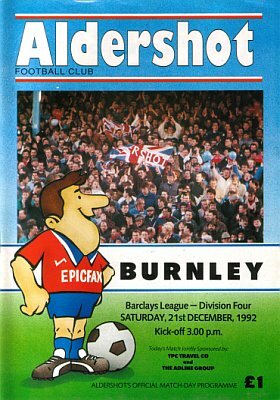 Once that early onslaught from Aldershot was weathered, Burnley steadied themselves. It was difficult, however, with Aldershot definitely having the advantage of the conditions. We needed to get to half time with minimal damage and we did just that, going in at 0-0, and you always fancied we'd get ourselves on top in the second half. We'd done well enough in the first half and when we were able to get the ball on the ground we looked too good for Aldershot. We came close to taking the lead in the first minutes of the second half. It came when Steve Harper, who was in brilliant form, crossed for John Francis. His goal bound header was blocked as was John Deary's follow up shot. Harper was beginning to run the show and twice he saw us come close to going in front. He fired one effort just wide and then saw goalkeeper John Granville prevent Graham Lancashire getting in a header. Granville was having a stormer for Aldershot and it looked as though he might earn them an unlikely point. Then we broke the deadlock. We won a throw in just over the half way line on the right. Measham threw the ball to HARPER who turned one man, skipped past another and then beat a third Aldershot player before hitting an unstoppable shot into the far top corner with the outside of his foot from no less than 25-yards. Within a minute we'd been denied again by Granville but in the next attack a cross from Mike Conroy was met by LANCASHIRE who hammered in a right foot shot. That was game over although Aldershot did pull a goal back late in the game when Charlie HENRY headed home a cross from Puckett, but Burnley were the winners and were top of the league as news came through of Barnet's win against Mansfield. Aldershot: John Granville, Kevin Brown, Leigh Cooper, Mark Ogley, Charlie Henry, George Berry, Steve Baker, Dave Puckett, Robert Reinelt, Mark Whitlock, Phil Heath. Subs not used: Jon Flower, Ian Stuart. Burnley: Chris Pearce, Ian Measham, Joe Jakub, Steve Davis, John Pender, Andy Farrell, Steve Harper, John Deary, John Francis, Mike Conroy, Graham Lancashire. Subs not used: Mark Yates, Adrian Randall. Paul Showler and Roger Willis were the Burnley heroes elsewhere. They scored Barnet's goals in their 2-0 win against Mansfield that ensured we'd be top of the league at Christmas for the first time in 19 years. 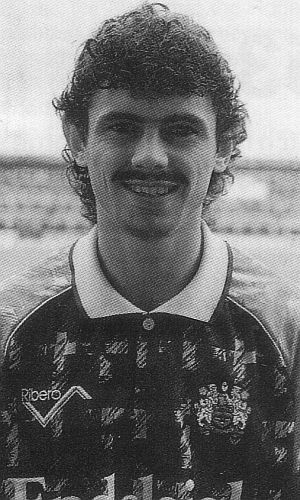 We were two points clear of Mansfield and a further point clear of both Barnet and Blackpool who had also win with Dave Bamber scoring the only goal in their home win against Carlisle. The rest of the field were some way behind but Scunthorpe had moved up to fifth with a 2-1 win at Doncaster, the second goal coming from their young midfielder Graham Alexander. Rotherham were at Turf Moor on Boxing Day. We'd beaten them at home in the FA Cup but they'd won the league meeting at Millmoor on the opening day of the season.